Campbell Robertson in today's Times provides yet another glimpse at the rapidly "evolving" business of commercial theatre. The theater projects are relatively cheap. Producers typically pay around $8,000 for an audience survey at three performances, including after-show focus groups, and a few dozen pages of analysis. The group also recruits tourists off the street for focus groups in its nondescript office at 1650 Broadway. But the linchpin of Live Theatrical Events is its partnership with Broadway.com, which gives it access to hundreds of thousands of theatergoers who use the site and information about their theatergoing habits. If a producer wants to know, for instance, if a show’s new advertising poster will appeal to middle-aged women outside New York who have seen “Mamma Mia!” twice, Broadway.com can get hold of 200 of them online. Evil? No. Surprising? Of course not. 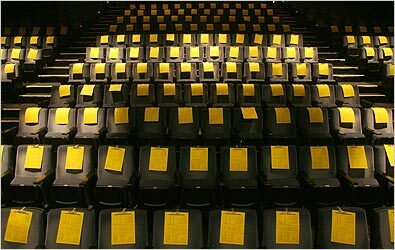 But just think of when those little yellow sheets become a common sight in the theatre. And I don't just mean on Broadway. I'm sure there are a lot of nonprofit Artistic Directors (and, more importantly Board members) across the country reading with great interest this morning. While Broadway producers need the data for investment advice, nonprofits will find all kinds of reasons--after all, they do marketing, too. And hand out enough of these sheets, the message to the audience (or "responders") is clearly: tell us what you want and we'll give it to you. Remember when "research" referred to dramaturgy and not demographic spreadsheets? Remember when post-show "talkbacks" were educational, not a free focus-group to help producers' profits? Remember when the phrase "Live Theatrical Events" referred to everything you loved about theatre, as opposed to the brandname of a company designed to make the experience as packaged and low-risk as possible? [A] group of 75 producers, managers and other professionals who had been meeting once a month this year to discuss the queasy financial state of Off Broadway theater...hired Mr. Craig [Joseph Craig, of Live Theatrical Events] to conduct a study, paid for by the League of American Theaters and Producers and the Theater Development Fund, which analyzed the audiences at 11 Off Broadway shows. With about 9,000 surveys, it was Live Theatrical Events’ largest project yet. Mr. Craig presented the analysis last week. There is a greater proportion of men in Off Broadway audiences compared with Broadway, he reported, and there are fewer tourists. Two-thirds of the audience members bought their tickets at a discount. And about half were not even aware that the show they were attending was part of something called Off Broadway. Commercial Off-Broadway has problems, alright. The audience doesn't know the difference from Broadway, and they haven't even paid full price. And they're not even tourists! The key, Mr. Craig said, was to market Off Broadway as an independent, risk-taking alternative to the big Broadway players, sort of like a theater version of Miramax, the movie studio that has often presented the smaller, more eccentric films that the big studios bypassed. Really! And to think they needed tons of professional marketing analysis to tell them that. Douglas McLennan--on whose ArtsJournal.com daily newsletter I rely so heavily on--has exactly the right heading for this article in his link today: "God Forbid They Ever Declare A Sweeps Month." Broadway is a lost cause, but you're right about the fear of "Homogenization" spreading to other areas. It will influence the premise, subject matter, type of actor, length of play, and many many other things. The same way the Hollywood runs now. Dust off the old writing recast with the new actor. Thanks for blogging this article, Garrett. Much in agreement with you. More from me here. While I'm in agreement, I just thought I'd point out that Ibsen did indeed rewrite the ending of A Doll's House for some German productions. He later called it a "barbaric outrage." So this kind of artistic compromise is nothing new. Still abhorrent though. Yes, I was waiting for someone to remind me of Ibsen's own "improvements". Well done. I believe he justified it with something along the lines of: "If anyone's going to bastardize my work it might as well be me." My thoughts are posted on my little blog. I'm not sure I think we should decry all market research and marketing tools as NECESSARILY negative. If this practice is abhorrent, if the work is bastardized, better than we try to prevent it from happening as often again as it has in the past instead of accepting its inevitability. This sort of perspective on theatre marketing is laying out the welcome mat to such risks, and there's nothing revolutionary about it. It's sheer opportunism and imitation of corporate practices. There's responsive and there's craven. Yes, we "purists" can dig our heads in the sand too far. And marketing is not inherently evil--perhaps even helpful. And yes, I want people to see theatre. But all I'm saying is if this Nielsen style focus-grouping does for theatre what it's done for TV, then I see little to be happy about. I think the essential issue (although I'm guilty of taking it another direction) is whether or not focus groups should guide artistic decisions. Categorically, of course, the answer is NO. That would be the tyranny of the masses. The flip side is, though, more access to what the audience thinks in a categorically defined way. Which can be a blessing and a curse. If I knew what others thought of me at all times, I'm not sure I'd act in a way that WASN'T influenced by that. You all really need to read TRUTH LIES AND ADVERTISING by Jon Steel. A crash course in the art of disruption might also be helpful.